After eight years of being a stay-at-home mom, Kim was ready to re-enter the workforce on her own terms. 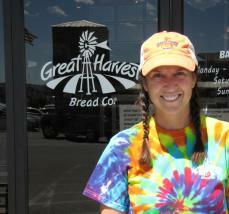 Reviewing options, she and her husband, Tye, recognized an un-met need for a bakery in Farmington. With no previous commercial baking experience, Kim and Tye laid everything they owned on the line, and took a leap of faith. Three years, one SBA loan, 16 employees, and literally tons of fresh bread and cookies later, the Bells are feeding and fostering their community. Kim attributes their success to their ingredients and to their dedication to doing the right thing, for their customers, their employees and the environment. The grain, freshly ground each morning, is grown by three Montana farmers specifically for Great Harvest Bread Company; it is pesticide free, non-modified, red wheat that is higher in nutrition than commercially available wheat, like that grown hundreds of years ago. It is this same level of caring that brings customers back and transforms workers into family. Employees are empowered to do whatever it may take to ensure customers feel valued. And, this same spirit of concern is expressed among employees watching out for each other. Former employees are known to visit whenever they are in town, some even washing dishes! Further illustrating this wonderful environment, Kim has had to let only 3 employees go over the years. But the caring does not stop at customers, employees or ingredients. All leftover products are donated to local charities; product that is not up to their standards is deposited in the pig barrel or the horse barrel around back for local farmers. Kim has a breadless dumpster; nothing is wasted. And doing it she is. Out of the 200+ Great Harvest stores, the Bells have won: Phenomenal Bread – New Store (2011), Top Sales – Young Store (2012) and Top 10 Sales Growth (2013). They have also received a local customer service award. Obviously, the business is flourishing; now Kim is able come in after dropping her children at school rather than at 3 am as when she first began. When asked about future plans, Kim says that her focus is on the delicate balance of being a mom, a wife and a business owner. However, she plans to be around in 25 years . . . and the SBDC will be here to support you, Kim!